You're probably thinking I've become a 'bible basher' recently but inflicting my own religious beliefs on others is not my game as I like to keep that boldness for my more intimate salmon fishing thoughts! The infliction of religious beliefs has caused more than enough issues on the planet and at the end of the day we are all truly Jock Tamson's bairns! I do believe in a higher spiritual being though and you should be able to call him whatever you wish. If you ever need to place yourself in an environment where you can talk to your creator then if you really think about it there physically couldn't be a better one than to be standing in or near a 'living' moving Scottish salmon river with a 15ft carbon fibre transmitter in your hands! The salmon river environment also has a huge calming effect on anyone who spends time on the river. The sounds and movements of a salmon river are truly hypnotic and within an hour even the most overly stressed 'commercial warrior' will go completely under her spell. There is however one God that I've had the pleasure of being around on numerous occasions over the decades and often I've often felt his presence before he's kindly turned one of his finest creations in the direction of my salmon fly. This God is always present and ever watchful for the salmon fisher who exudes quiet confidence yet with a humble approach to the salmon river. If you pal it up with this God he'll develop you into a salmon fishing machine and give you enough 'feel for the river' to fill up a classroom of otters! Get that God on board and you'll start looking at the salmon rivers in a different dimension. 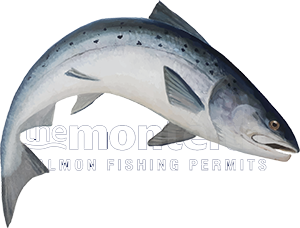 Your eyes will be almost able to tell your mind what's going on under the surface and even though you're only seeing the river surface you'll already have worked out the entire riverbed features and potential salmon lies with the briefest of glimpses of any salmon pool. Surface boils, swirls and smooth glides will become your primary focus and these visible features paired with the varying pace of the currents will tell you all you'll need to know!